When FCP Euro caught wind of a European Car Show happening at the Petersen Automotive Museum, we knew we couldn't miss out. 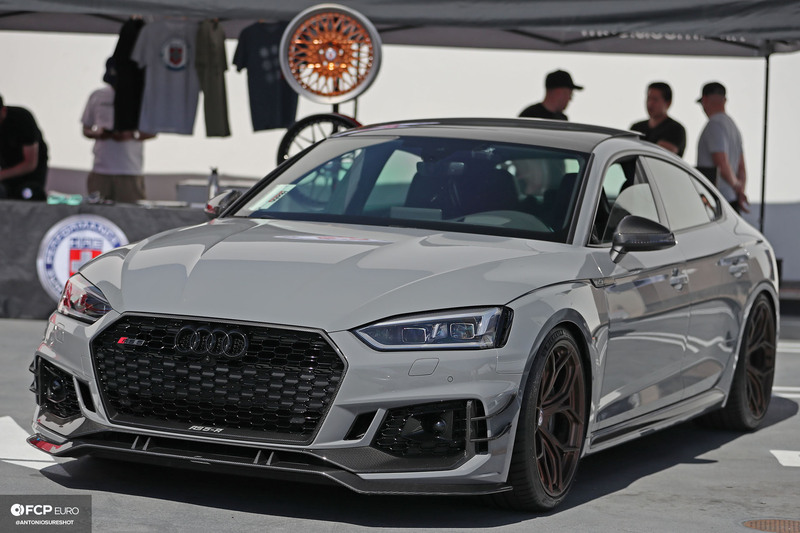 The show's organizers from the Southern California-based DubNation, California Car Cover, and HRE Wheels are good friends of ours, and we immediately knew that the Euro19 show would have some awesome builds in attendance. Although we spotted tons of interesting cars from Southern California's Euro car community, this widebody GTI on Rotiform 3-piece wheels certainly caught the attention of most show attendees. Whether you're a fan of aftermarket widebody aero or not, it's not every day you see humongous widebody flares, an aggressive front lip spoiler, and a vented hood on a GTI. This car definitely made people look. While many attendees were gawking at the widebody GTI, our eyes were drawn to the simplicity of this GTI with Enkei RS05-RR wheels. Although these wheels aren't crazy expensive, they're actually highly regarded by time attack and race drivers in Japan. Back in the day, aftermarket tuning magazines kept on publishing stories about how the lightest wheels are the best for track performance, so Volk Racing's TE37 became super popular. However, when Japanese wheel manufacturing giant Enkei first developed their new RS05 Racing Revolution wheels, they discovered that the overall stiffness and rigidity of their new RS05-RR wheels makes an even greater difference. The extra rigidity helped time attackers achieve faster lap times when tested on the same exact cars, using the same exact drivers and same exact tires—even though their RR wheels are not lighter than Volk's highly popular TE37 wheel. Interesting! Anyway, it was awesome to see a high-end Japanese wheel like this on a newer Vee Dub! There were certainly a lot of VW Golf owners with white cars in attendance. 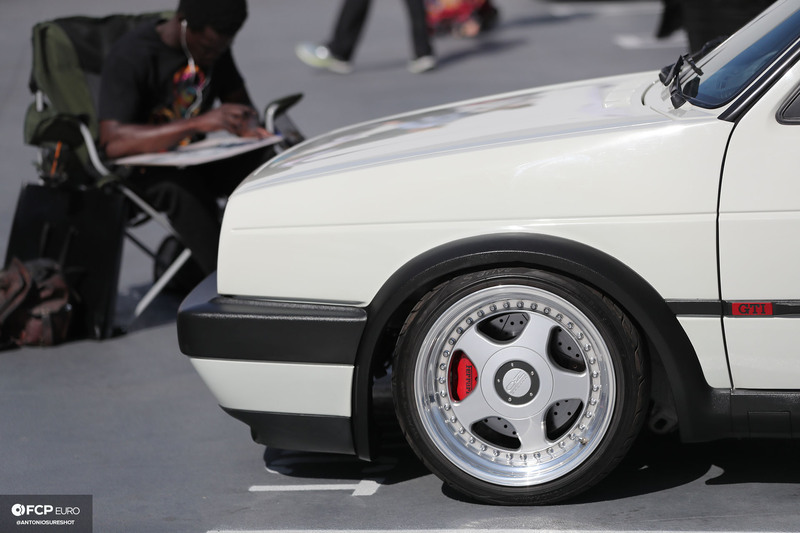 This white GTI also stood out, with big brake rotors peeking through the spokes of its three-piece OZ Racing wheels. Upon closer inspection of the wheels, we noticed it said Ferrari on the brake calipers, which made us think of 1000 more questions. What Ferrari are these from? Are they actually from a Ferrari? How'd the owner get them? How'd the owner get them on the car? Unfortunately, the owner of the car wasn't around so if you have any guesses, leave them in the comments below. Everyone knows that Volkswagens have some of the best looking interior designs out of any cars on the market. The VW brand is regularly winning design awards and praise from Motor Trend and, more importantly, from within our office. 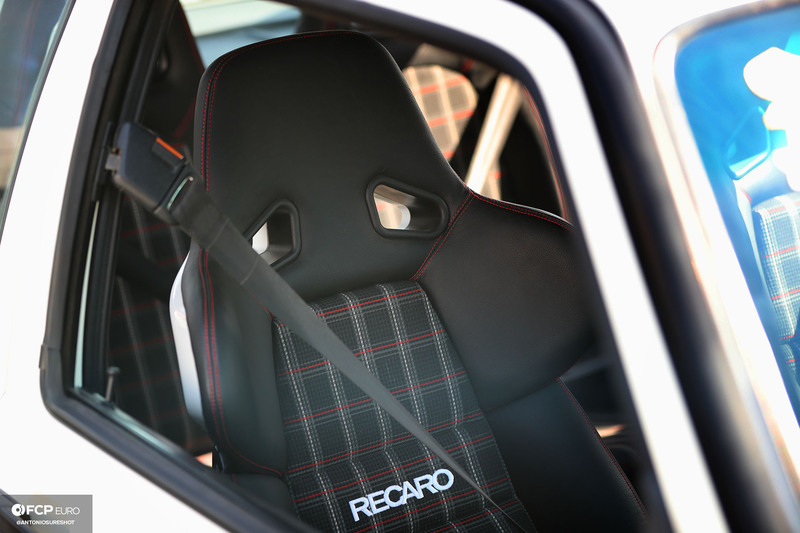 The owner of this GTI took it a step further, with signature gray, black, and red plaid fabric covering the rear seats along with the Recaro reclinable buckets up front. The Recaros even have red contrast stitching to make the subtle red stripe on the fabric pop even harder. Now that's what we're talking about! The subtle red accents on the seats provide design continuity to the interior, making the red stripes on the inner door panels (and even the red buttons on the seatbelt release) pop. Love it. That's not even the end of it - look at the fabric pad on the 350mm steering wheel, and the Recaro horn button! The placement of the red stripe on the fabric pad matches up perfectly to the red line on the dashboard too. But wait, there's more! 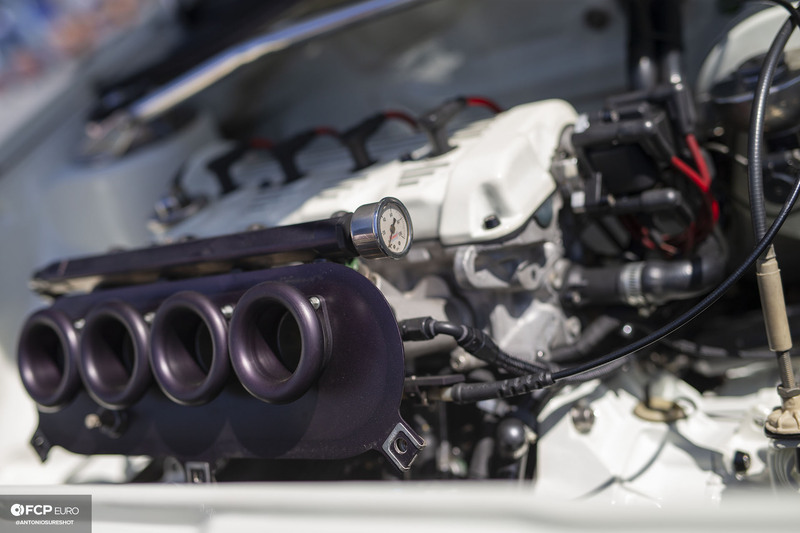 A glance under the hood will reveal a super clean white engine bay, with dark anodized trumpets from the Borla Induction individual throttle bodies and manifold mated to the engine's intake ports. Outstanding. 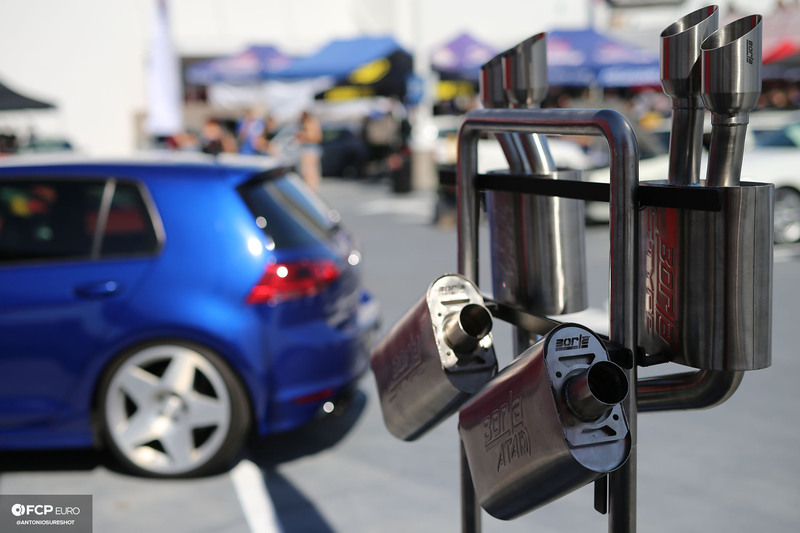 Speaking of Borla Induction, there were actually representatives from Borla Exhaust showing off their own Euro cars at the event, while answering questions about the company's exhaust and induction parts specifically made for European cars. It's so great when huge companies engage in smaller, local car community events to engage with people on the ground level. Borla, for example, is a massive exhaust company everyone has heard of, but what most may not know is most of their employees are actually European car owners and enthusiasts themselves! 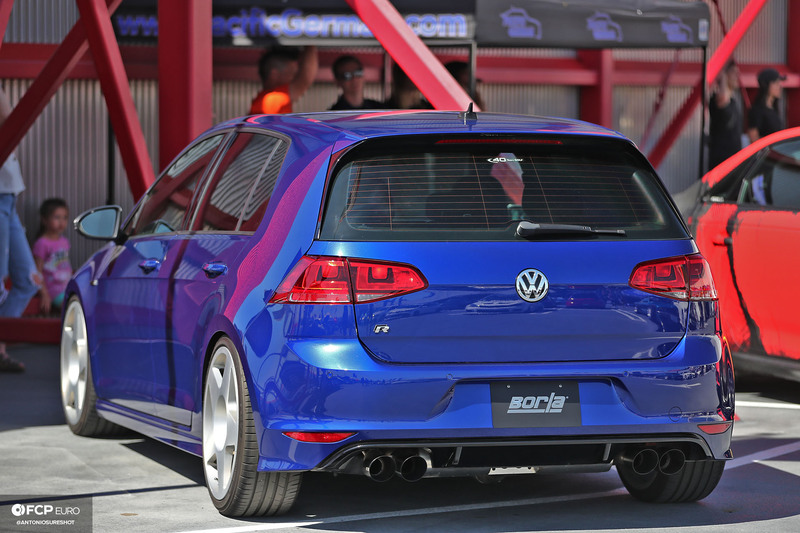 In fact, the blue Mk7 Golf R above with Fifteen 52 wheels actually belongs to their marketing manager, and we've met other employees at the company that own Audis, slammed BMWs, and even a track-prepped VW R32. 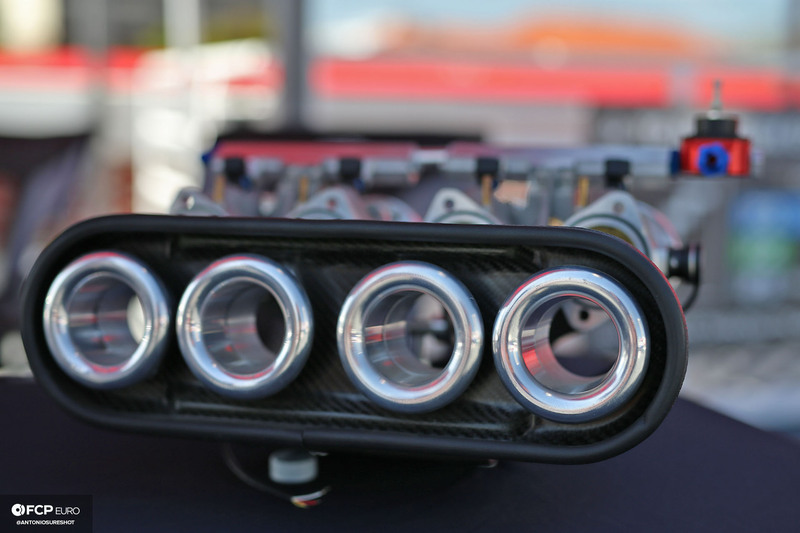 We also saw this awesome example of ITB trumpets accompanied with a carbon fiber airbox. It's so gorgeous you could just leave it on a coffee table for guests to gawk at. Although they have application-specific throttle bodies for certain cars, this particular individual throttle body kit is actually universal, meaning it can mount up as an ITB replacement/upgrade to any car with DCOE dual side draft carburetors. This means they can work on a Volkswagen, a BMW, a Benz, whatever! By the way, when's the last time you saw a Mercedes Benz 560 SEC slammed this low with wheels that fit like this?! For when you want to bring your entire family to a car show, there's always the coveted European SUV, of which there were a few at the show. This lowered Audi SQ5, for example, shows you don't have to have to have the latest and greatest sports car to enjoy a car meet with friends and/or family. 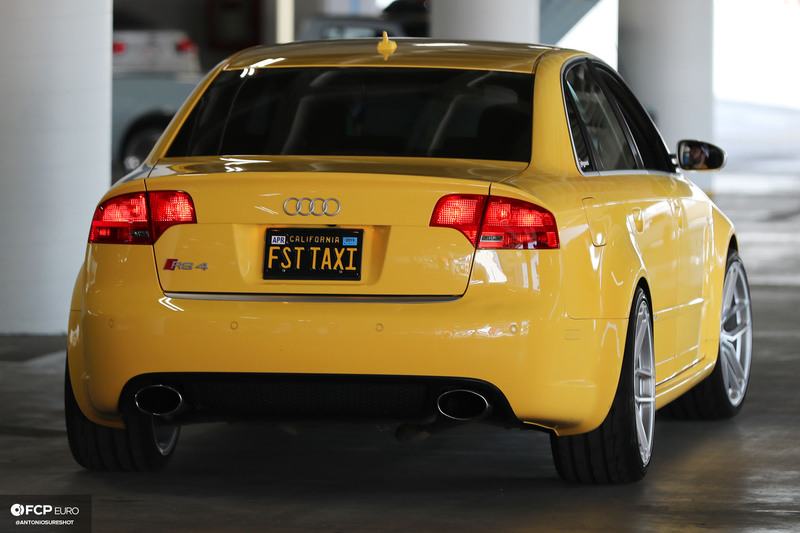 This yellow Audi RS4 was one of the cleanest we've ever seen, but as the license plate says, it was pretty fast. We didn't even see the car until it was exiting the parking lot, and since it drove out pretty quickly, we unfortunately didn't get to connect with the owner. We'd love to shoot more photos of that thing! We spotted a menacing Audi RS5 parked in front of the HRE Wheels booth wearing one of the best coats of paint ever made, Nardo Gray. The dark color tones of the car make it look mean, especially with the front lip spoiler. 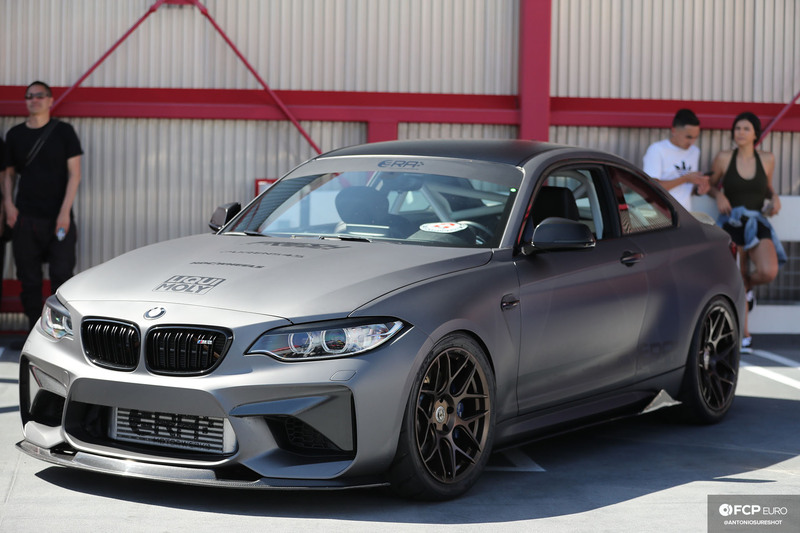 Also in front of the HRE booth, we spotted this BMW M2 with a front-mount intercooler and a pretty aggressive roll bar in the rear. Apparently, the owner of the M2 uses LIQUI MOLY products to maintain the engine, and we are in full support of that! 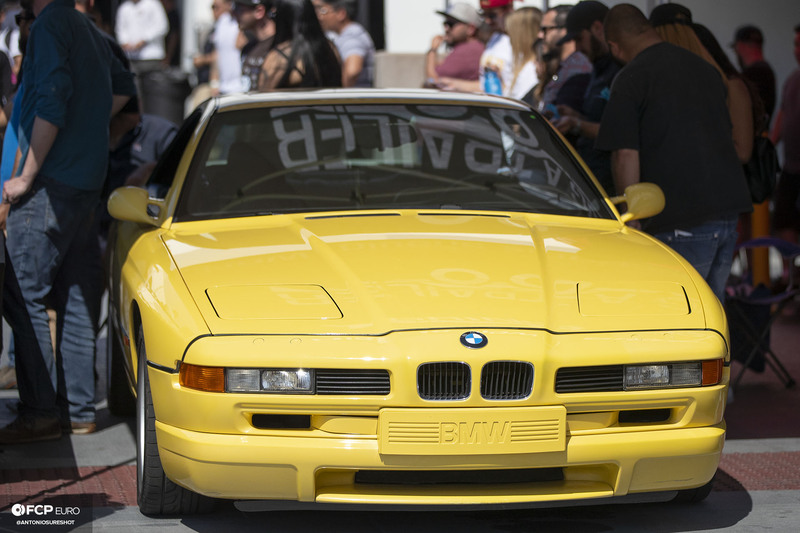 It was tough not to notice the striking Dakar Yellow paint on this Euro BMW 850CSi while it was mellowing out in the shade. Was this the very same car for sale on Bring a Trailer? 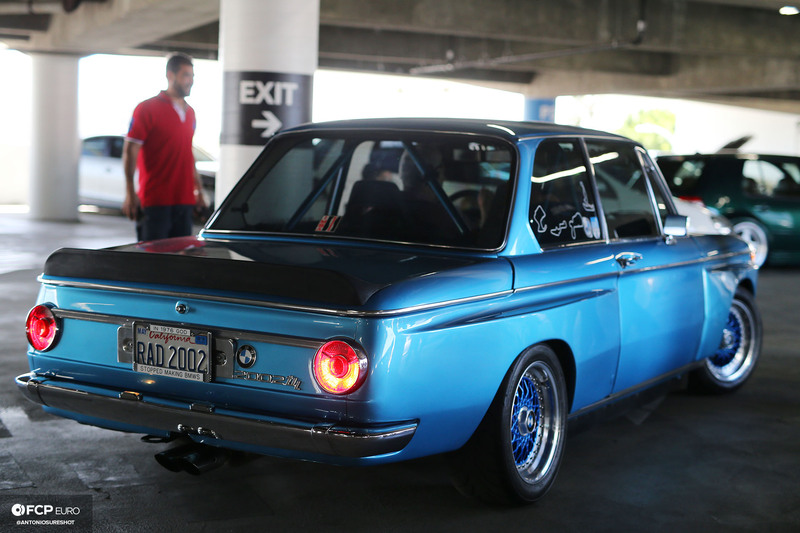 We spotted this gorgeous BMW 2002 Tii with box flares and a roll bar just as it was leaving the event. By looking only at tail lights, bumpers, and mirrors, can you tell the model year of the car? There were other interesting Bimmers at the show as well. This E21 had paint coming off its front bumper, but no worries... it still caught our attention with the wild fender flares and front lip spoiler. It was tough not to notice this slammed Golf R32 with gleaming red paint lurking in the shadows in the parking structure. 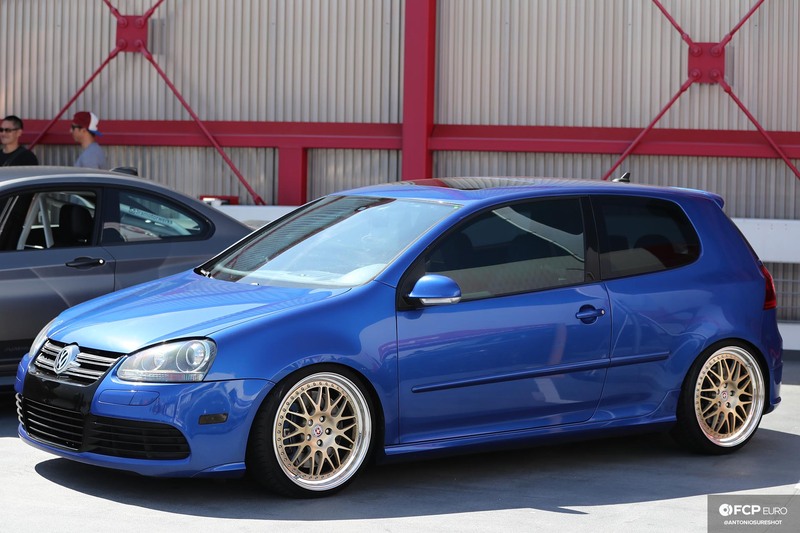 While it might not have 3.2l VR6 power under the hood, this blue MK5 Golf GTI was looking mighty clean with those champagne-colored HRE mesh wheels filling the fender wells, with a big brake kit behind them. Super fresh. 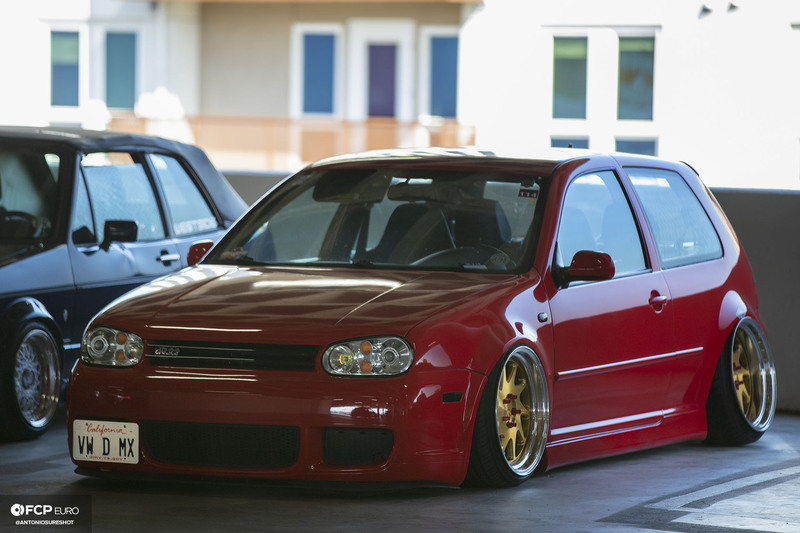 We absolutely love the clean, thin black bumpers on this Golf GTI. This was probably the best condition early GTI that we saw at the show, but to be fair, we didn't get to see all the cars, because we only caught the tail end of the event. We were speeding home from shooting the California 8 hour endurance racing event at Laguna Seca, which is five hours away from Los Angeles! Have you ever seen a set of wheels that made you want to cuss? Please comment below if you feel us on this! 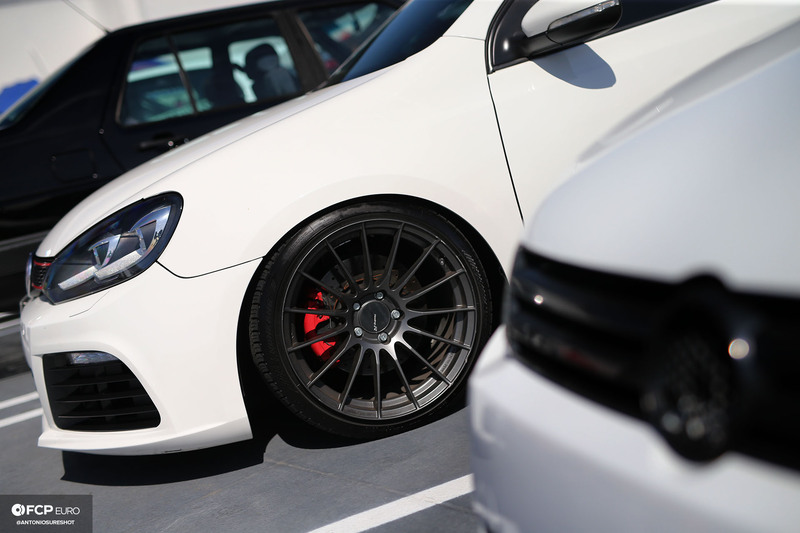 When we saw this clean white GTI with these super ridiculously sick BBS five-spoke three piece wheels, we definitely blurted out some loud expletives. Damnnnnnn. Sorry kids! Not all the cars that showed up to the Euro19 event were complete. 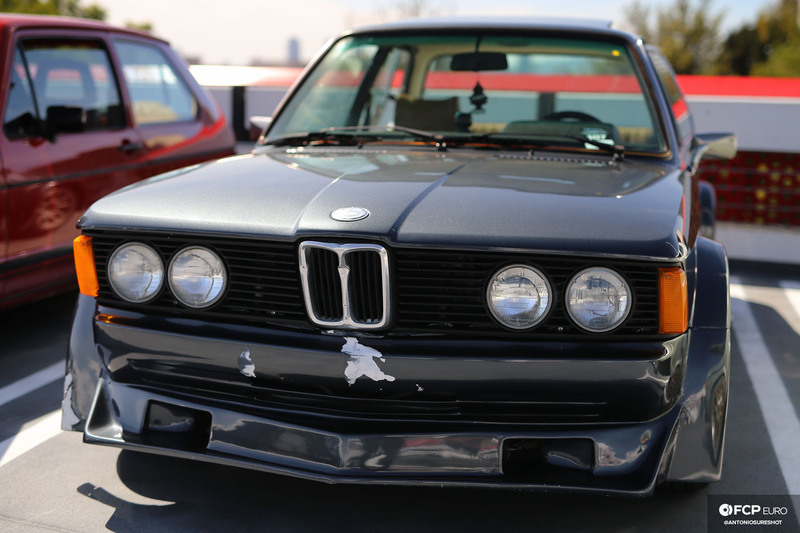 This E30 BMW convertible was parked at the Petersen with the soft top up, and unpainted Pandem Rocket Bunny-style box flares riveted on the car. A Japanese heart-shaped tsurikawa was hanging from the rear bumper. For those who aren't familiar with Japanese shakotan (low-down car) culture, maybe a brief car culture lesson is in order. We first began writing about this type of car culture on the MotorMavens website in 2009, and even before that, on the Speedhunters website back in 2007 and 2008... and even before that, in obscure print magazine articles (Super Street and Modified Magazine) that most people have probably forgotten about by now. However, some of these bosozoku guys who drove cars also modified their cars in a loud, obnoxious, crazy manner (but to be honest, it looks pretty damn cool because it's so different). They made their cars super low (shakotan) with wide wheels, big exhaust pipes, crazy fiberglass widebody kits, rear wings, and front lip spoilers. This whole trend and automotive subculture can be observed in the Japanese cult classic anime (cartoon) and manga (comic book) entitled Shakotan Boogie. Anyway, the tsurikawa was derived from the subway train handles that these bosozoku guys would cut and steal from the Japan Rail trains, then attach underneath the rear bumpers of their cars to draw attention to how low their cars were. Tsurikawa are traditionally supposed to be the actual round white plastic rings that people hold onto on subway trains in Japan, but after time, people started making custom tsurikawa, like the red heart shaped one you see above. What does tsurikawa have to do with European car culture? Nothing at all. It doesn't match European cars, just like the "Tuna. 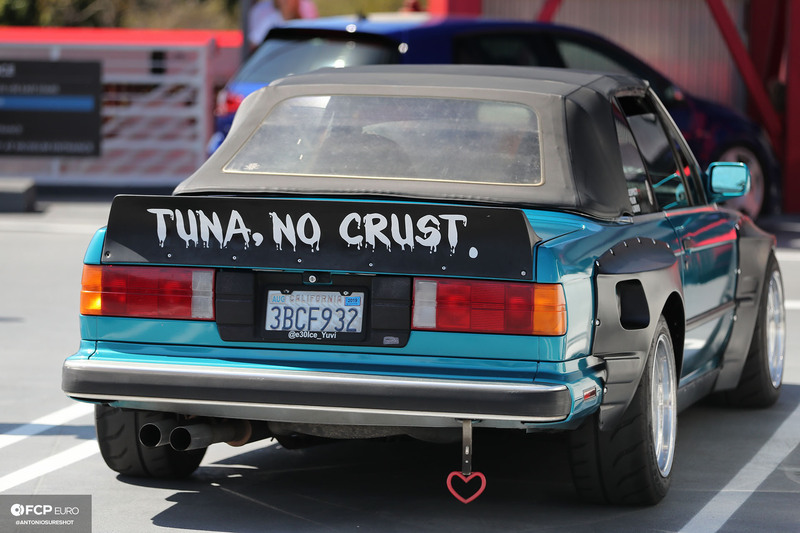 No Crust" Fast & Furious movie reference doesn't match the overall look of the E30 vert above. However, that's the thing about car culture—people just interpret it the way that they want to. 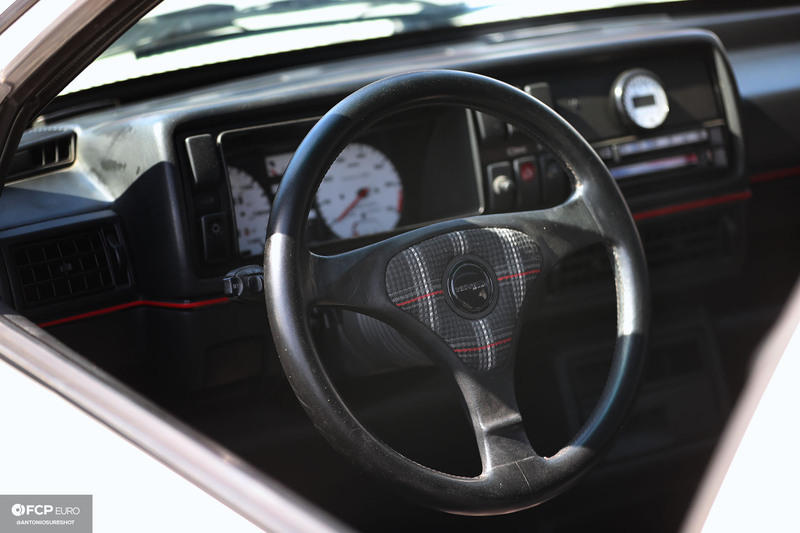 Nowadays, car culture and the styling of one's car has become as much a form of personal expression as the type of sneakers or jacket people choose to wear. Some people won't like your car, and some people will love it. Maybe that's the greatest thing about car culture. Just like music and art, it connects different people in different ways.